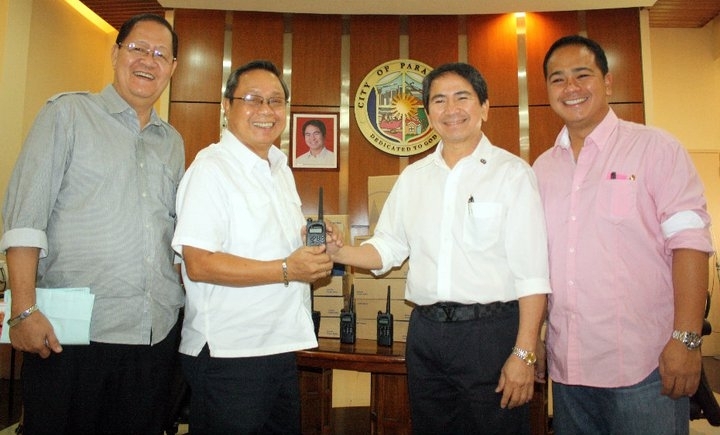 As additional input to the Peace and Order Program and continuing effort to build the capability of BGUs, the Parañaque City Government under the administration of Mayor Florencio Bernabe, Jr. donated 30 hand-held radio communication units to the Barangay Government Unit of La Huerta. In photo (R-L): City Councilor Benjo Bernabe; Mayor Jun Bernabe; La Huerta Brgy. Chairman Ernie Jose; and Brgy. Sec. Manuel Tangco.